Varroa destructor (Anderson and Trueman), is the world's most devastating pest of Western honey bees, Apis mellifera Linnaeus (Hymenoptera: Apidae). 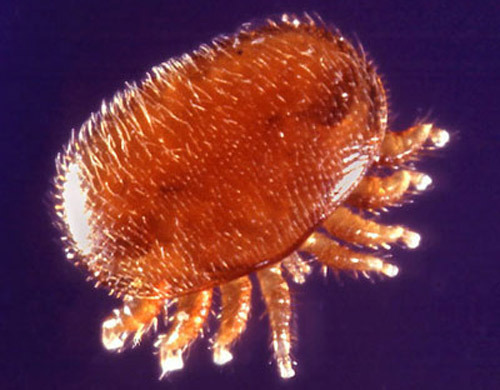 Although the Varroa complex includes multiple species, Varroa destructor is the species responsible for the vast majority of the damage attributed to mites from this genus. Until 2000, it was believed that Varroa jacobsoni Oudemans was the mite responsible for widespread honey bee colony losses. However, taxonomic work published in 2000 (Anderson and Trueman 2000) indicated that a previously-unidentified species of Varroa (Varroa destructor) was responsible for the damage, while Varroa jacobsoni was shown to be only moderately harmful to western honey bees. This publication is limited to Varroa destructor. Varroa are ectoparasites that feed on the hemolymph of immature and adult honey bees. Apis mellifera, the Western honey bee, is not the mite's natural host. In fact, the mite is native to Asia where it parasitizes another cavity-dwelling honey bee, Apis cerana Fabricius (the eastern or Asian honey bee). Apis cerana is believed to have some natural defenses against the mite and consequently rarely is affected negatively by the mite. Only when colonies of Apis mellifera were brought to Asia did people begin to realize how devastating the mites could be. Varroa's host shift did not occur instantly, as evidence suggests that it may have taken 50-100 years (Webster and Delaplane 2001). Since that time, the mite has spread around the world and has become nearly cosmopolitan in distribution. Those countries not hosting Varroa maintain strict quarantine procedures to lessen the chance of an accidental importation of the mite. Figure 1. Varroa distribution reported in peer-reviewed scientific literature as of 2014. Figure by Chase Kimmel, University of Florida using Esri ArcGIS 10.2: the world map layer is from Natural Earth and the data was acquired from a review of the scientific literature. Adults: The adult female mites are reddish-brown to dark brown and oval in shape, measuring 1.00 to 1.77 mm long and 1.50 to 1.99 mm wide. Their curved bodies fit into the abdominal folds of the adult bee and are held there by the shape and arrangement of ventral setae. This protects them from the bee's normal cleaning habits. Adult males are yellowish with light tan legs and spherical body shape measuring 0.75 to 0.98 mm long and 0.70 to 0.88 wide. The male chelicerae are modified for transferring sperm. Figure 2. 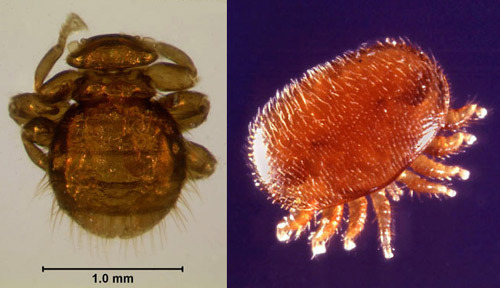 Adult female Varroa destructor Anderson & Trueman, ventral (left) and dorsal (right) views (lower right), with a honey bee's metathoracic leg (top) for scale. Photograph by FDACS - Division of Plant Industry. Figure 3. Adult female Varroa destructor Anderson & Trueman, anterior view, showing curvature of body. Photograph by FDACS - Division of Plant Industry. Figure 4. Dorsal view of Varroa destructor Anderson & Trueman. Photograph by Scott Bauer, USDA. Eggs: The eggs are oval in shape and white in color, and are laid singly on a cell wall. Eggs are approximately 0.30 mm long and 0.23 mm wide. Eggs generally cannot be seen by the unaided eye. Nymphs: Male and female protonymphs are undistinguishable without dissection. Protonymphs have eight legs, pointed chelicerae (mouthparts) and are a transparent white color. The body appears circular, as they do not develop the oval shape until the deuteronymph stage. After the protonymph molts, the mite becomes a deuteronymph which resembles the adults with a reduction in setae. The mite will molt once again, into the final adult stage. Although Varroa destructor is a natural parasite of the Asian honey bee, most of its biology has been determined using the Western honey bee due to the mite's importance as an economic pest on this honey bee species. With that in mind, most of the following discussion will relate to Varroa's presence on Western honey bees rather than on Asian honey bees. Adult female Varroa can be found either on adult or immature honey bees. They must, however, reproduce on honey bee brood (developing larvae or pupae). Immature Varroa can be found only on capped brood and male Varroa will never leave these brood cells. 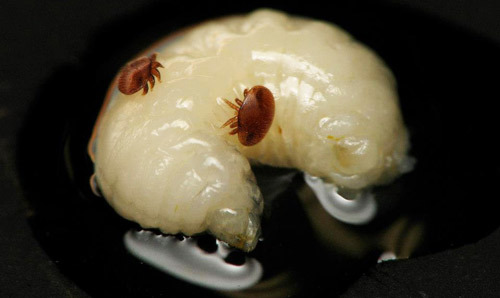 Although small, a Varroa female is one of the largest ectoparasites known when considered in relation to its host. Because Varroa-associated damage is caused by female mites, the remaining discussion of the life cycle will proceed from the female Varroa's perspective. Adult females undergo two phases in their life cycle, the phoretic and reproductive phases. During the phoretic phase, female Varroa feed on adult bees and are passed from bee to bee as bees walk past one another in the colony. During phoresy, the female Varroa live on adult bees and usually can be found between the abdominal segments of the bees. Varroa puncture the soft tissue between the segments and feed on bee hemolymph through the punctures. Anatomically, female Varroa are well-adapted bee parasites. Their flattened shape allows them to fit between the abdominal segments. Furthermore, they have claws that allow them to grasp the bee and ventral setae that allow them to remain attached to the bee. The mite's cuticle has a chemical pattern similar to that of the bee's, possibly allowing it to escape notice while on the bee. Additionally, the cuticle is highly-sclerotized, thus occasionally protecting it from bee aggression. Phoretic Varroa also can be passed between colonies when infested bees drift into another colony. This happens frequently in managed honey bee situations where individual bee colonies are located within meters of one another. It is common for bees in this situation to return (drift) to the wrong colony. Interestingly, it has been shown that bees from colonies heavily infested with Varroa drift more than bees from uninfested colonies (Schmid-Hempel 1998). Varroa passing within a colony from bee-to-bee and between colonies by drifting demonstrate that the mites are transmitted horizontally. Varroa also may pass between colonies in other ways. First, beekeepers often aid weak colonies by adding bees or brood from a healthier colony, and this practice helps spreads the mite. Second, beekeepers may transport colonies from one area to another, facilitating the spread of Varroa regionally. Third, individual colonies may swarm, moving to a new location and spreading Varroa simultaneously. Finally, mites may spread between colonies as bees from the colonies rob (steal honey from) one another. It is common for strong colonies to rob weaker colonies in periods of nectar scarcity. Mites pass easily from bee to bee in these instances. All of these methods have contributed to Varroa's global distribution as a honey bee pest. The phoretic period of the mite appears to contribute to the mite's reproductive ability. Although mites artificially transferred to brood cells immediately after they mature are able to reproduce, their reproductive rate is lower than that of mites undergoing a phoretic period. The phoretic period may last 4.5 to 11 days when brood is present in the hive or as long as five to six months during the winter when no brood is present in the hive. Consequently, female mites living when brood is present in the colony have an average life expectancy of 27 days, yet in the absence of brood, they may live for many months. In order to reproduce, phoretic mites must enter bee brood cells. Honey bees construct a waxy matrix in which they form hexagonal compartments or cells. Queen bees oviposit in these cells, and three days later a bee larva emerges from the egg and begins to develop. Once the larva reaches a certain age, worker bees in the colony construct a waxy capping over the entrance to the cell. The larva develops into a prepupa and then a pupa under the capping. After an egg is oviposited, an adult worker, drone, or queen bee emerges from the cell 21, 24, or 16 days later (aged respectively). Varroa females must enter a brood cell before the bees seal it. In Western honey bee colonies, they may enter either a worker or drone cell, but mites are more attracted to drone brood. A mite that is ready to reproduce will leave the adult bee on which it is feeding and crawl down the wall of the cell to the honey bee larva at the bottom of the cell. At this point, the female mite is referred to as a foundress mite. Only larvae ready to be capped are attractive to the mite. After crawling under the larva, the female mite will submerge itself in the brood food under the larva where it will remain until the cell is capped by other worker bees. While submerged, the mite erects its peretrimes which serve as breathing tubes, allowing the mite to breathe while it is submerged. Once worker bees have capped the cell, the larva consumes the remaining brood food, thus freeing the mite. The freed mite climbs onto the larva and begins feeding. The mite defecates on the upper part of the cell wall while feeding on the bee. Shortly thereafter, the mite lays its first egg on the surface of the cell wall. The egg is unfertilized and will develop into a male mite. Subsequent fertilized eggs are oviposited by the female mite toward the back of the cell approximately every 25 to 30 hours. These hatch into female mites. The newly-emerged protonymphs join their mother on the ventral side of the developing bee pupa around the bee's 5th abdominal segment. Here, the mother and offspring alternate between periods of feeding on the bee and defecation on the base of the cell. 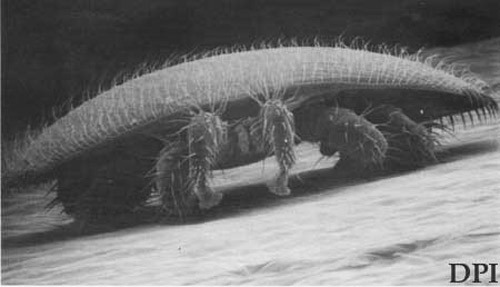 The developing protonymphs molt into deutonymphs and then into adult mites. The entire process from egg to adult mite takes six to seven days for both sexes of the mite. Unless more than one foundress enters the cell prior to capping, mite offspring are forced to mate with their siblings. When male Varroa undergo their final molt, their piercing mouthparts change into hollow tubes. The male mite uses this structure to transfer packets of sperm to openings in the female, at the base of her third pair of legs. Although the adult female Varroa can infest and reproduce in more than one cell, it mates only in the cell in which it was born. Shortly after mating, the sperm transport system of the female Varroa degenerates, thus prohibiting future matings. Considering mortality in brood cells and improper mating, the average foundress mite produces about one offspring per worker cell she enters, and about two offspring per drone cell. Drones take longer to develop so more mites are produced in drone cells. Therefore, in the average temperate climate, mite populations can increase 12-fold in colonies having brood half of the year and 800-fold in colonies having brood year-round. This makes the mite very difficult to control, especially in warmer climates where colonies maintain brood year-round. 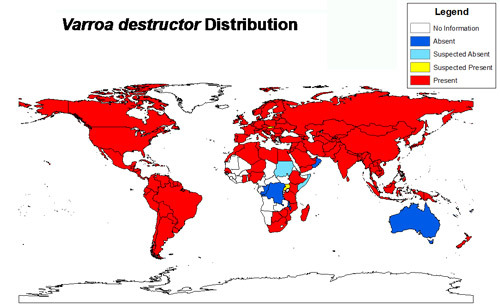 Varroa have affected the apiculture industry negatively in every country that it has been introduced. Individuals reporting the effects of Varroa after they arrived in the U.S. stated that honey bee colonies would not survive unless beekeepers intervened with a chemical treatment (Webster and Delaplane 2001). Accurate estimates of the effect of Varroa on the apiculture industry are hard to find, but it is safe to assume that the mites have killed hundreds of thousands of colonies worldwide, resulting in billions of dollars of economic loss. Varroa have caused beekeeper production costs to rise, thus lowering the profit margin in beekeeping. Varroa also have affected the feral (wild) population of bees in many areas. 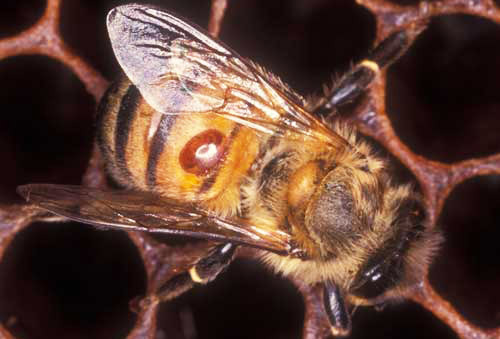 Since feral colonies were not managed for Varroa and the colonies were left unprotected, the loss of feral colonies quickly resulted as Varroa continued to spread. On the other hand, feral colonies that survived Varroa infestations have slowly developed resistance mechanisms that have allowed them to persist in the presence of the mite. This did not happen with managed colonies because beekeepers started treating chemically for Varroa almost instantly, thus keeping alive susceptible populations of bees. This practice is changing. Varroa weakens and ultimately kills colonies by out-reproducing their host. Typically, bee populations peak in late spring/mid summer with a steady decline in population occurring in mid-late summer. Varroa population increase is similar to that of the bees but is offset by a number of weeks. Therefore, Varroa populations are just beginning to peak when bee colony populations typically begin to decline. This is usually the start of significant mite problems. Varroa rarely kill adult bees, but they do shorten the lifespan and may even alter bee behavior. Varroa can kill immature bees, and their ability to do so is correlated with the number of Varroa foundresses that enter a brood cell prior to it being capped. The more mite foundresses in a cell, the less likely the immature bee will develop successfully and emerge as an adult. For some time, scientists have known that honey bees host a number of viruses. There is evidence that some of these viruses are associated with Varroa presence and levels in a colony (Webster and Delaplane 2001). It now is believed that Varroa can transmit multiple viruses to their hosts and that these viruses, not the mites themselves, may cause the majority of the damage that bees experience while hosting the mites (Webster and Delaplane 2001). 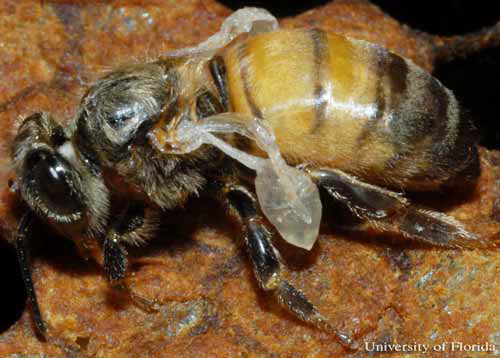 To illustrate this point, one of the most telling signs of a Varroa presence in a colony is the occurrence of newly-emerged adult bees with misshapen wings. A virus, called deformed wing virus (DWV) and present in immature bees, is responsible for this symptom. Bees with this virus are unable to use their wings and will die or be killed by the other workers within a few days of emergence. Deformed wing virus can be so prevalent in maturing bees that they can emerge without any wings at all. Researchers suspect that other viruses play an important role in the Varroa mite/honey bee relationship, but the roles of these viruses are not well understood. Figure 5. Newly emerged worker honey bee exhibiting symptoms of Deformed Wing Virus, which is transmitted by the Varroa destructor Anderson & Trueman. Photograph by University of Florida. The detection and treatment of Varroa is an ever-changing science. Since the mite's spread around the world, methods to accomplish both have been investigated and refined. Because detection and treatment are dynamic topics, this treatise will focus only on general methods rather than specific techniques. Although small, Varroa can be seen on adult bees with the naked eye. They often are found feeding between segments on the bees' abdomens or crawling quickly elsewhere on the bees' bodies. Figure 6. A female Varroa destructor Anderson & Trueman, feeds on the hemolymph of a worker bee. The mite is the oval, orange spot on the bee's abdomen. Photograph by James Castner, University of Florida. Varroa look very similar to another bee commensal, the bee louse, (Braula coeca, Diptera: Braulidae) and this has led to mistaken identifications. Despite this, identifying them is simple if one remembers that the bee louse is a wingless fly with six legs, while Varroa is a mite with eight legs. Figure 7. 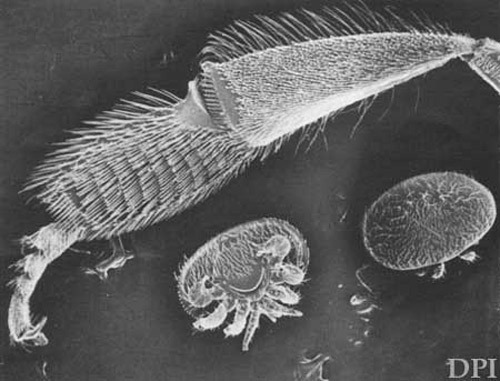 Dorsal views of an adult bee louse, Braula coeca Nitzsch, (left); and an adult Varroa destructor Anderson and Trueman, (right). Varroa are more oval in shape, and have eight legs as compared to the bee louse, which has six legs. Photograph by bee louse - University of Florida; Varroa - Scott Bauer, USDA. A much better way to look for Varroa in a colony is to examine bee brood. 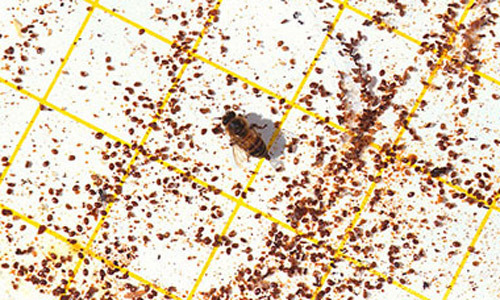 It is easier to find mites on drone brood (although finding them on worker brood is possible) because (1) Varroa are attracted to drone brood more strongly than they are to worker brood and (2) drone brood is easier to remove from the cells. Immature bee brood is white, making it very easy to see the reddish-brown Varroa. Figure 8. Two female adult Varroa destructor Anderson & Trueman feeding on the hemolymph of a honey bee pupa. Photograph by Jason Graham, University of Florida. Even though Varroa can be detected visually on adult and immature bees, the number of mites on each only gives one an index rather than an accurate measurement of Varroa populations in the hive. Measurements have become more accurate with the advent of sampling tools, the most popular of which is sticky screens, ether rolls, or sugar shakes. Varroa sticky screens are pieces of cardboard coated in a sticky substance. The cardboard is then covered with a wire mesh that prohibits bees from touching the sticky substance but allows Varroa to fall through the mesh. These screens can be inserted under the honey bee nest and used to trap falling mites. Varroa, both living and dead, regularly fall off their host bees. This may be facilitated by the grooming activity of the bees, but it probably occurs naturally as well. When a sticky cardboard insert and screen are present underneath the nest, the falling Varroa will pass through the screen and get trapped on the sticky surface of the cardboard. Researchers have been able to correlate mite fall in 24-, 48-, and 72 hour periods with actual Varroa populations in the colony (Delaplane and Hood 1997). Sticky boards are useful because they sample the entire colony for the presence of Varroa, rather than any subset of bees within the colony. Figure 9. Varroa destructor Anderson & Trueman attached to a sticky board removed from the bottom of a beehive. Photograph by Peggy Greb, USDA. Ether rolls yield quicker results than sticky traps but can be less accurate because only a subset of the entire colony is sampled. In an ether roll, about 300 adult bees are collected in a glass jar and sprayed with ether. After the ether is added to the jar, the jar is lightly shaken for 30 seconds, during which time Varroa present on the adult bees will adhere to the inside walls of the jar, facilitating their quantification. A newer version of this sampling protocol has been developed using powdered sugar rather than ether. Once the dusted bees are shaken, the bees can be released (they are alive) and the sugar can be dumped into water. After contacting the water, the sugar dissolves, thus facilitating Varroa quantification. The sampling methods were not used very often traditionally because treatment for Varroa was recommended twice yearly, regardless of the number of mites in a colony. Recently, investigators around the world have tried to employ an integrated pest management (IPM) approach to Varroa control. Sampling devices are paramount in this management scheme where treatment is recommended after Varroa populations in a colony reach an economic threshold. A sampling device is needed in order to determine when an economic threshold is reached. Many studies have been conducted in an effort to determine the economic threshold for Varroa in a colony but results have varied. Factors affecting the economic threshold include temperature, colony strength, geographic location, the presence of other pests/pathogens, level of colony resistance to Varroa, etc. As such, an economic threshold for Varroa probably will not be universal and will have to be determined regionally. In the U.S., independent studies have suggested that the economic threshold for Varroa is around 3000 mites/colony (Delaplane and Hood 1997). Again, this number will vary depending on a number of factors, including those listed above. With the establishment of economic thresholds and sampling devices, Varroa management has become easier, although IPM is not as widely-practiced by beekeepers as one would hope. Traditionally, Varroa have been controlled chemically. In fact, chemical-based, in-hive treatments have followed Varroa everywhere the mite has been introduced. Pyrethroids, organophosphates, essential oils, and organic acids have been used by many countries to control Varroa. Initially, the pyrethroid fluvalinate showed high levels of efficacy (>90%) against Varroa. However, the mites have a demonstrated ability to become quickly resistant to this and other synthetic acaricides. This has made many acaricides useless in areas where Varroa resistance to chemicals has developed. Further exacerbating this is the issue that many of the synthetic chemicals used inside of bee colonies to control Varroa double as insecticides in other pest-management schemes. So, Varroa have required beekeepers to put insecticides into insect colonies, the results of which are only just beginning to be understood. The effects of chemical Varroa treatments on honey bees include reduced longevity of queen bees, reduced sperm loads in and longevity of drones, brood death, and reduced queen laying patterns. Many more effects are believed to exist. Because of the reduced efficacy of chemicals used to control Varroa, attention has turned to the application of non-chemical methods for limiting Varroa populations. For example, Varroa are attracted disproportionately to drone brood. This has led some beekeepers to practice selective removal of drone brood from bee colonies after it has been capped. This practice eliminates a cohort of mites from colonies. Also popular is the use of screened bottom boards to lower mite populations. Although its level of efficacy is debated, replacing solid bottom boards of a bee colony with screen mesh can reduce Varroa populations as much as 14%. A number of other non-chemical methods purported to lower Varroa populations are used by beekeepers, with varying degrees of success (some do not work at all). Some, such as placing colonies in full sunlight, modestly reduce Varroa populations. Others, such as dusting the adult bees in the colony (often with powdered sugar), fogging mineral oil and other liquids into the colony, and using small-cell comb, have been shown to have little or no effect on overall Varroa populations. It is important to note that although concrete data supporting the efficacy of these methods is lacking, future research may establish a benefit from these and other similar practices. Without question, the most significant advancement toward controlling Varroa non-chemically has come in the realm of bee breeding. A number of bee defensive responses to Varroa have been identified and selected for in natural and artificial breeding programs; the most notable of these are hygienic behavior and grooming behavior. Bees that exhibit grooming behavior use their legs to comb themselves. They do this both to themselves and to other bees in the colony. This behavior can increase the number of Varroa that fall off of the bees, thus lowering the number of Varroa in a colony. Hygienic behavior is the most studied of all of the natural defenses against Varroa. Although it is not a behavior specifically targeting Varroa, its manifestation can lower Varroa populations within a colony. Bees that are hygienic can detect many problems that affect brood (American foulbrood, Varroa, chalkbrood, etc. ), even if the brood is capped, and remove the affected brood. Because Varroa go into cells immediately prior to the cell being capped, hygienic bees are given little time to find Varroa before the cell is capped. As a result, hygienic bees have a refined ability to detect Varroa in capped cells, remove the capping, and abort the brood. Often, this behavior can lead to the death of the mite, thus lowering Varroa populations. It is interesting to note, a heightened form of hygienic behavior called Varroa Sensitive Hygiene (VSH) has been found in some bees. VSH bees are able to detect Varroa in capped cells and remove only those Varroa that are reproducing. Effort also has been concentrated in finding races of bees that are generally resistant to Varroa. This includes bees that do not have a single defensive behavior targeting Varroa yet maintain a very low mite population in the colony. Probably the most successful of these programs includes the Russian honey bee program headed by the United States Department of Agriculture honey bee genetics lab in Baton Rouge, Louisiana, USA. Russian bees are a European subspecies of honey bee introduced into eastern Russia over 100 years ago. Because Varroa are native to the area, Russian bees have developed a general resistance or tolerance to the mite. Russian bee queens were introduced into the U.S. in 1997 and are gaining popularity among beekeepers. Many feel that Varroa control is maturing holistically even though this approach is slow to be adopted by beekeepers. Ample research has shown that an IPM-based approach to Varroa control is more economical than the conventional methods heavily relying on chemical pesticides (Webster and Delaplane 2001). For example, using any combination of the non-chemical Varroa controls mentioned above can lower Varroa populations in a colony >40%. Despite this, holistic Varroa control will continue to mature and can be improved. Anderson DL, Trueman JWH. 2000. Varroa jacobsoni (Acari: Varroidae) is more than one species. Experimental and Applied Acarology 24: 165-189. De Jong D. 1997. Mites: Varroa and other parasites of brood. pp 278-327. In Honey Bee Pests, Predators, and Diseases (Third Edition). The A.I. Root Company, Medina, Ohio. Delaplane KS, Hood WM. 1997. Effects of delayed acaricide treatment in honey bee colonies parasitized by Varroa jacobsoni and a late-season treatment threshold for the southeastern USA. Journal of Apicultural Research 36: 125-132. Schmid-Hempel P. 1998. Parasites in Social Insects. Princeton University Press, Princeton, NJ. 410 pp. Webster TC, Delaplane KS. 2001. Mites of the Honey Bee. Dadant and Sons, Inc., Hamilton, Illinois. 280 pp. Publication Date: June 2010. Latest revision: May 2016. Reviewed: March 2019.